"If you are interested in research, especially at Miami, everyone is extremely willing to have undergraduate students work in their lab, so there’s no reason to not be trying that…if you get involved in research early enough, like as a freshman or sophomore, you can ultimately get credit for it if you want." "My dad went to Miami and was very enthusiastic about his experience, so I decided to look into coming here myself. I was particularly drawn to the good relationships students can build with their professors here, and I also liked Miami's physics program. "I've always been interested in math and physics, the latter of which I enjoyed during both my junior and senior year of high school, so I thought I'd start college with physics as my major. Inherently, the physics major requires several math courses, so with the space left in my schedule, I eventually added it as a second major. "My first semester at Miami was really a kind of exploration. I didn't know for sure what I was going to do, but I was already interested in math and physics. On top of those, though, I thought I'd take some biology, chemistry, and even psychology classes. There were a lot of different opportunities for me to explore to help me figure out exactly what field I wanted to go into." "Now that I'm a senior, I've rarely had a class that had over 40 people, and all of my upper-level physics classes have no more than 15 people in them. This has given me a great opportunity to get to know my professors. Whenever I have a question, they've been very happy to help me. My professors have been very open to talking about different things, like when there's something related to physics in the news or even music. Establishing these relationships has really helped me in my academics. "During my sophomore year, I joined Professor Paul Urayama's biophysics lab to do measurements for a soon-to-be-published paper and then presented the data at the Undergraduate Research Forum in the spring. 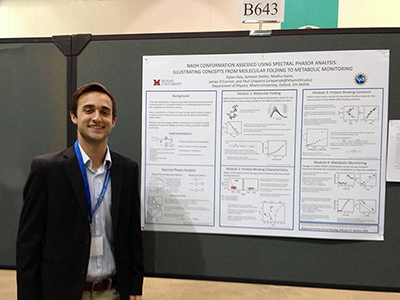 Dylan Palo stands next to his research proposal at the 2016 Biophysical Society Conference in Los Angeles. "I decided to continue that research through the summer, which was made possible by the Undergraduate Summer Scholars (USS) program. I would recommend that to anyone who has even the slightest interest in pursuing science for graduate studies, or even something like medical school. Doing research at Miami is just an unbelievable experience, and USS allows you to do it during the summer. You get into the methodical process of working on research every single day. 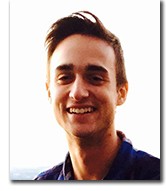 "Later, in the spring of my junior year, I was given the opportunity to present on behalf of our research lab at the annual Biophysical Society Conference in Los Angeles, which was a great, eye-opening experience. I'd never done anything like that before in my life! "I have truly enjoyed the combination of working in Dr. Urayama's lab while taking his classes. This semester is the 4th semester I've had him as a professor. He has played a tremendous role in helping me get the experiences needed to get into the doctoral programs in physics I hope to enter after I graduate." "When you're a freshman or early sophomore and don't know what you want to study, a liberal arts education lets you pursue different subjects and try them out. If you don't like it, then you can try something else! One way of doing this is through the required Miami Plan classes, where students experience a lot of different concepts and ideas. "For me, although I decided to continue with physics, this still involved me taking a bunch of classes, adding a major, taking another bunch of classes, and then switching my major a few times. One semester early on, for example, I took both a biology and a chemistry class because I was thinking of going pre-med, but then I decided to take 5 psychology classes in case I wanted to add a psychology major instead. Despite all that, I changed my mind and decided to stick with physics! I ended up adding mathematics as my second major, but physics was always my thread throughout. "I realized that physics could provide explanations for everything from how the stars are created to how a cell or an atom functions—everything uses physics at the most basic level. These fundamentals give you the basis for understanding how the world, life, everything works, and this realization came about partially through my ability to explore a variety of classes." "When I got started working in Professor Urayama's biophysics lab as a sophomore, I wasn't sure how long I'd be there but figured it would be an interesting opportunity. I remembered learning in 7th grade how a cell works, but biology doesn't talk about the specific functions behind many of these processes. That's where biophysics comes in, which looks at the mechanisms behind what you learn in biology. "Research opportunities are something that a lot of Miami professors, especially those in the science departments, offer to students. Miami's physics department does not have a doctoral program, so much of the research is done by undergraduates. Everything we're doing feels localized and intimate, as if we're only working on one little project, but at the same time there's a congregation of different people with different perspectives and techniques that are all doing the same thing. It's a very cool environment. "In the lab we've been adding different chemicals to cells to observe metabolic responses. One of these chemicals is called TTFA, which is an inhibitor of the electron transport chain. We add it and compare the results with additions of cyanide, which also is an inhibitor. By looking at these two different inhibitors, we want to see how the different complexes in the cell's electron transport chain are paired together. "For example, if you inhibited the cells independently, but they produced the same results, it would suggest that the two systems are very tightly coupled. But if you saw different responses, it would suggest that these complexes are more independent than we had originally thought. "Our project is currently focusing on looking at the conformation of NADH molecules inside cells, which are very important in respiration and fermentation pathways and metabolic processes. During fermentation and respiration, NADH binds to a variety of proteins. The difference between the proteins forces NADH to have a slightly different conformation in the binding process. Each conformation of NADH creates a particular emission spectrum, which gives us an inside look at the processes that are going on. Particular signatures from the spectrum tell us what the cell might be doing as far as metabolic processes go. "In Professor Urayama's lab we use a process called spectral phasor analysis, which involves ultraviolet light, to map the cell's emission spectrum into other spaces. This could have many possibilities in areas like cancer research. If scientists can learn about how a cell is functioning simply by shooting UV light into the cell, this could be a very harmless way of understanding how they work. "My research on spectral phasor analysis led me to receiving the Undergraduate Research Award this past February. This allowed me to conduct research on my own with funds given by Miami. I'm also utilizing my research for my CAS Dean's Scholarship and will be presenting at a conference this coming spring. We're deciding among several venues, including Miami's Undergraduate Research Forum, a regional conference, and the national Biophysical Society Conference next year in New Orleans." "The most important thing I can say is to immediately get into doing research. Immediately! If you are interested in research, especially at Miami, everyone is extremely willing to have undergraduate students work in their lab, so there's no reason to not be trying that. "On top of that, if you get involved in research early enough, like as a freshman or sophomore, you can ultimately get credit for it if you want, and it's a great opportunity to take advantage of. Undergraduate research will definitely open up new possibilities in terms of scholarships, awards, and ultimately graduate school and an interesting career."